In casting about for his encore, Thomas had originally traveled to India but quickly realized that while yogis and snake charmers could generate some interest in their exoticism, they were unlikely to produce the kind of palpable excitement his earlier show had achieved. For Thomas's tastes, India was altogether too tame; however, adventure beckoned just over the border to the west in "forbidden Afghanistan." Remote ("In fact, their country is still as isolated as Japan was at the time when . . . Commodore Perry went over there and convinced the people of the Land of the Rising Sun that they ought to be more neighborly"), rugged ("If there is a wilder country anywhere on earth today than Afghanistan, I know not of it"), and inhabited by tribesmen reputed to be as ferocious as any on earth ("So deep is their love of fighting that when they can't pick a quarrel with outsiders, they snipe back and forth across their hills and carve each other, just to keep in practice"), Afghanistan was the perfect location for Thomas's brand of derring-do, and he could see that its frontier tribes were every bit the equal of the North Arabian Bedouin who had provided such a handsome supporting cast for Major Lawrence. Like the Arab Bedouin, the Afghan tribesmen possessed a hawklike grace that would make their violent customs all the more thrilling for a Western audience, and this bunch reportedly possessed one attribute in even greater abundance than their Arab cousins: religious fanaticism. Thus, as Thomas journeyed along the north-west frontier, his British hosts regaled him with stories of tribesmen who had "gone ghazi," colonial parlance for what happened when a tribesman suddenly and without warning struck off on his own private path of jihad, knifing or shooting the Christian closest to hand. Afghanistan might be just the thing for his second act, but in order for this Thomas travelogue (and accompanying books and magazine articles) to live up to the success of its predecessor, it would need one last ingredient. Other showmen featured breathtaking landscapes, strange rituals, and local amusements—all of which Thomas deployed in his shows—but he had catapulted to the top of his profession by featuring a compelling narrative built around a galvanizing central presence. In "With Allenby in Palestine," Thomas had portrayed the gruff, no-nonsense General Allenby as a modern-day Richard Coeur de Lion, capturing the Holy Land from the dark eminence Kaiser Wilhelm. In "With Lawrence in Arabia," Thomas had cast the now-famous Major Lawrence as an eccentric scholar caught up in the mysteries of the past until compelled by circumstance and his Anglo know-how and nobility to mold a ragtag mass of native irregulars into a disciplined army. For this Afghanistan show, he needed something comparable: a story line and a leading man that could give his travelogue a deeper resonance and meaning. This time, however, there was no war going on and no European who was a logical candidate for the starring role.2 This time, Thomas would have to look elsewhere for his leading man, and in short order he set his sights on a native character who, despite the handicap of not being European, just might serve his purposes. It all began with the mysterious death of the King Habibullah, but there is also another mystery. The present Ameer [Amanullah] forgave his two elder brothers and merely made them renounce their rights to the throne. But nobody knows what became of the uncle. He was made a prisoner, and that was the last that any of us ever heard of him. Perhaps he may be deep in one of our prisons. Perhaps he is dead. Only Allah knows. The prospect of meeting Amanullah at the end of the journey was just the narrative gambit that Thomas needed for his travelogue, and with that goal in mind he assembled his party for the journey to Kabul. "Soon, if Allah willed it, and if Amir Amanullah Khan, Light of the World, did not change his mind, and if his zesty subjects did not shoot holes in our car, and if none of the disasters that usually overtake travelers east of Suez befell us—why, then we would pass out of the old Bajauri Gate at Peshawar and journey to mysterious Afghanistan, where so few Westerners had preceded us. "3 Strangely, however, the events that followed this invocation turned out rather flat. There were, of course, the requisite heat, dust, and flat tires, but the trip itself proved anticlimactic—so much so, in fact, that Thomas was forced to stage and photograph the tribal ambush of a motorcar to illustrate the dangers of the Khyber Pass. The ensuing days on the road to Kabul proved no more noteworthy, up to the time that they were finally to meet the amir, an encounter that Thomas hoped would be "the high spot of our Afghan adventure." "Why we're home," shouted [Harry] Chase [Thomas's cameraman]. "We've never left the old U.S.A. Why this looks like the outskirts of East Orange." And it did look like it. We were all amazed. The gateway through which we passed had an exceedingly familiar appearance. There was nothing Oriental about it. It looked like the entrance to a brand-new real-estate development on the outskirts of Kansas City or Detroit. And once we had entered we were among typical suburban bungalows, frame houses with sleeping porches and breakfast nooks. His Majesty intended this to be his summer capital, and he said he wanted it done in the latest style. He thought some Western architectural ideas might go well. That's right where I shine. I told him just to leave it to me. Hadn't I been in Hollywood? So I've been making a new Hollywood out of this place, a Hollywood without movie stars, bathing beauties, movie lots, or cameras! It's been up-hill going. You see I'm the only one in Central Asia who knows anything about Hollywood architecture. Following their meeting with Tewfik Bey, Thomas's party was left to stroll about, waiting for the appearance of Amanullah himself. With time on his hands, Thomas's ever-fretful cameraman worried aloud about the impending meeting. What, he asked in a whisper, was the proper way to address an amir. A third member of their group replied ominously that it was best "not to say anything at all. . . . If you start talking out of turn to an absolute monarch, you are liable to be turned over to the mad elephants or blown from the mouth of a cannon." No sooner were these dour comments uttered, however, then the amir himself appeared before them, "a stocky man of middle height, with a short mustache and protruding dark brown eyes. You could see that he was a man of jolly and yet strong personality. He also looked as though he enjoyed the good things of life." Not only was Amanullah's appearance rather unexceptional, but "the Ameer was not dressed nearly so magnificently as you expect a king to be." In fact, his clothing was "rather shapeless and clumsy," for it turned out that, as an encouragement to home industry, he was sporting English-style clothing made in a local factory. And if this attire were not enough to dissipate any illusions that the travelers might have retained about the absolute amir, there was also the evident ease and casualness with which he interacted with his companions and they with him. This group included the two older brothers whom Amanullah had displaced to become king. Thomas remembered the "many dark legends of the Orient, where it has been the custom for ages for a king to kill off all his near relatives for fear that they might try to dethrone him." However, such speculations were soon dispelled; the amir donned sporting attire to play a set of tennis with a group of these same relatives and later, while being photographed by Chase, relinquished his seat on a noble charger so that various of his companions could have their pictures taken on the same steed. All these episodes diffused the air of mystery surrounding the Afghan amir, but perhaps the most telling moment from Thomas's point of view was their first handshake, which was "firm and decisive." As Thomas noted, there was "nothing languid and Oriental about it," a comment that signaled the demise of the Arabian Nights fantasy Thomas had been constructing in his mind. American to the bone, Thomas couldn't help but like a man with a firm handshake. Likewise, for Chase, Amanullah's status as a regular Joe was sealed in an equally convincing manner when he displayed his skill at tennis. Chase noted that he had played some formidable tennis himself in his day, but he was sufficiently impressed by the amir's "cannonball service" to offer the singular compliment that "this Oriental potentate is a regular Oriental wizard at this Occidental pastime." The amir further endeared himself to Chase when he willingly assumed whatever pose the cameraman demanded of him. Despite the evident discomfort of his courtiers, who wrung their hands at the sight of a bumptious American ordering their monarch to turn this way and that, Amanullah himself remained unperturbed by Chase's liberties and even suggested that a man who issued commands as forcefully as Chase could find useful employment in his army. In the face of such down-to-earth good cheer, whatever suspicions and preconceptions Thomas and his party had been harboring soon disappeared, but so too did the story line that Thomas had been building for his travelogue. For all his affability, Amanullah would not make quite the leading man Thomas had hoped for. The air of mystery and intrigue had been dispelled, and the show that Thomas would end up producing would be less like the adventure epic he had achieved with Lawrence and more like the generic, narratively unfocused travelogues that Thomas hoped to avoid. Thus, when Thomas returned to London in the fall of 1922 and opened "Through Romantic India and into Forbidden Afghanistan" at Covent Garden, the show drew respectable audiences, but nothing like the acclaim and success of his earlier production. Ultimately, it seems, Western audiences of the day proved to be more intrigued by the tale of a Westerner who donned Bedouin robes than of an Easterner in tennis garb, and the story of a distant king trying gradually and peacefully to modernize his country did not have the same resonance as that of a European going in and doing the same job by brute force of will. What no one could know at the time was how either story would end. It was only just becoming apparent in 1922 that the cause of Arab independence that Lawrence had championed had been betrayed by the European powers. And in another seven years Amanullah would be overthrown by his own people, who resented and distrusted the Western-style reforms he was urging on them rather more forcefully than Thomas had realized during his brief visit. Despite the different outcomes of Thomas's theatrical productions, it is possible to discern a greater affinity between Amanullah and Lawrence than either Thomas or his audience seem to have been able to recognize at the time—an affinity that is perhaps suggested in the unhappy outcome of both men's careers. In an odd way, Thomas's two leading men were mirror images of one another, each being seen in his dress, manner, and action as a variant of the "Oriental" of Western imagining. In Lawrence's case, the fantasy centered on the notion of the Westerner becoming more Oriental than the Oriental himself in order to tame the savage and to bring order to a far corner of the world. In Amanullah's case, the fantasy had to do with the Oriental himself recognizing the superiority of Western ways and voluntarily submitting himself to the discipline and enlightened attitude of the West in order to raise his people up out of their degraded condition. Though he has not received the same sort of fervent attention as Lawrence, Amanullah has himself been the focus of considerable attention, with Western writers tending to view him as a tragic hero whose noble attempt to modernize his country was ultimately undone by the forces of bigotry and backwardness. My own view, shared by many Afghans, is that Amanullah was a man blinded by his own egotism and fascination with the West into launching an ill-advised and overambitious set of reforms that his people were not prepared or ready to accept. Amanullah was the archetypal reform ruler so much in evidence in the colonies and colonial borderlands in the post-World War I period. Some of these native reformers were successful, but most left behind an unhappy legacy. Amanullah was among the unsuccessful; in this sense he can be seen, as much as Lawrence, as a Knight Templar of our disorders, and for him as well "cross-dressing" can be seen as a symbol of the ambiguous legacy he left behind. As Thomas discovered during his brief stay in Afghanistan, Amanullah was immensely fond of wearing different styles of clothing. His most common dress appears to have been a spartan military uniform, but among the photographs that have survived of the king are a number showing him in costumes associated with the different ethnic and tribal groups in Afghanistan. He is also seen in royal regalia in a handful of photographs—sometimes dressed in the music-hall uniform of a pre-World War I military officer, complete with plumed helmet, sometimes in the improvised costume of a Eurasian monarch. One especially revealing photograph comes from a costume ball held in a villa in Paghman in 1925. The guests included Amanullah himself and most of the prominent members of his entourage. Typical of the progressive culture of the court, men and women bedecked in exotic finery intermingle as they line up to have their picture taken. Most of the guests have adopted ethnic dress from Afghanistan and its border lands. Others have found costumes from further afield, including Burma, Japan, Africa, Europe, and Arabia. A few, including Amanullah himself, have chosen vintage outfits—Amanullah having donned a costume from the reign nearly one hundred years earlier of Amir Dost Muhammad (1828-1863), while his elder brother Enayatullah has chosen for the occasion an outfit of the sort his grandfather, Amir Abdur Rahman, typically wore (if, indeed, they are not the dead amir's very own clothes). One gets from this photograph the sense of an insular world wrenched open, a world in which people have recently become aware of the larger universe of cultures outside their own and have rushed to embrace them. In court photographs taken five to fifteen years earlier, one can see the impact of European (specifically, English) goods—Victorian wallpapers, gowns, and the like—but here we see people dressing themselves not just in the European style but in a way that is self-consciously cosmopolitan. In earlier pictures, those posing in Western garb appear stiff and uncomfortable: they are adopting a foreign style in a purely imitative manner. Here, the attitude seemingly has changed. The evident playfulness and irony seem novel. At the same time, there is also a sense of unreality. This costume ball was held shortly after the government had suppressed the first serious popular uprising against Amanullah, an uprising that had gained momentum in large part because of discontent over Amanullah's reform program. In response to this challenge, Amanullah briefly curtailed some of his more controversial plans for modernizing Afghanistan, but the evidence of this photograph is that he was still living in a hermetic cultural space closed off from the reality of his society, a reminder of which can be seen in the lower left of the picture. There sits Adeko, one of the wives of Amanullah's father, the late Amir Habibullah. Alone among the partygoers, Adeko is dressed in the clothes appropriate to her background and station. While all about her others fashion themselves in identities other than their own, the not-very-merry widow stares forlornly into the camera, a grim reminder in the midst of gaiety of the old ways and the grimmer world outside the villa's gates. The photograph illustrates the central paradox represented by Amanullah and all reformers of his era, the paradox of whether a person is who he was born to be or whether he is who he chooses to become. Traditionally, in both England and Afghanistan, birth had determined social position and action, but in the case of both Lawrence and Amanullah the idea became flesh that identity could be constructed, that a man could become something other than what he had been born to be, something that he created for himself. Thus, just as Lawrence sought to fabricate an identity different from the one he had been assigned by the circumstances of his birth, so Amanullah also chose to create a persona and role for himself that was fundamentally different from the one that he had inherited from his father and grandfather. Amanullah intended to be a more populist ruler, and it was his conceit that just as he would move closer to his people, so would he raise them closer to him through mass education, the elimination of stultifying social customs, and the reduction of religion's grip on people's values, practices, and concerns. Amanullah became famous for this project; it has been viewed as the substance of his failed reign. Less often remarked on was the extent to which Amanullah was also attempting to change the rules by which identity was formulated for himself and his people. In his dress, in his manners, in his actions, he was trying to become not just a different person but an entirely new sort of person, and in the process of constructing this person he was also attempting to construct a new sort of nation and a novel understanding of what exactly a king should be, what was properly in his scope of action, and how he should relate to the people he ruled. Like Lawrence's, Amanullah's transformation wasn't just a matter of putting on different clothes and appropriating manners other than his own. These changes were indeed one element in the equation, and their symbolic importance cannot be underestimated; but it must also be recognized that style and substance were intertwined. In fashioning his oddly amalgamated identity, Amanullah was trying fundamentally to reconstitute the moral foundations of Afghan society. I arrived in Afghanistan from the west, traveling by bus through Turkey and Iran, entering first the city of Herat in the west, then journeying by bus to Qandahar and finally to Kabul. It was late in June 1975, and I had graduated from college just a month or so earlier and was now prepared to teach English at the U.S.-government-sponsored language center. Like Thomas, I had been drawn to Afghanistan by exotic tales of camel caravans, turbaned tribesmen, and women in veils. All of this I discovered, to be sure, but Afghanistan in the mid-seventies was a very different place from the one Thomas had encountered fifty years earlier. For one thing, where there once had been few foreigners to speak of in the country, there were now swarms, some tourists of the accustomed sort, but even more hippies or, as they called themselves, world travelers—WTs. The center of activity for the WTs was Shahr-i Nau, the New City, and the hotels and restaurants catering to them on and near Chicken Street, named for the area's poultry market, which had been displaced by the foreign invasion. WTs manifested little discernible interest in Afghanistan or Afghans. Foremost in most of their minds was hashish (which was plentiful in Kabul), inexpensive ratatouilles and omelets to assuage their drug-fueled appetites, and the pleasure of their own spaced-out, casually licentious company. With the exception of those who served and benefited from the WT economy, most Kabulis with whom I came in contact ignored the young Westerners, not so much it seemed because they were shocked by them but rather because they were involved in their own intense love affair with modernity. The American Center, where I worked, was the largest of a number of English-language schools in the New City, and all were packed with students. Everyone from shopkeepers to businessmen to schoolgirls wanted to perfect their English, and they all crammed together in our classrooms—the girls sitting in clusters and the older men keeping to themselves, but otherwise all joined together in the shared communion of getting ahead. Most of my students also came to class in Western clothes, which they bought at the second-hand clothes bazaar. In and around the school, I rarely saw a turban or the all-enveloping burqa veil that traditional Afghan women wore. To the contrary, my nearest exposure to the exotic Afghanistan of my imagining anywhere close to the school was in neighboring antique shops, which sold rusting scimitars, helmets, flintlocks, and the like—most of which, one would assume, had been pieces of someone's patrimony, cherished artifacts of past battles before they'd been sold off for cash. At the time, I had little grasp of what any of this meant or where it was headed, but a hint was given to me in the form of an ethnographic documentary that was previewed in the auditorium of the cultural center shortly after my arrival in Afghanistan. The film was entitled Naim and Jabar, and it was the account of two boys who lived in the village of Aq Kupruk in northern Afghanistan. The older of the two boys was back in his village for summer vacation. His lifelong friend was a year younger and hoped to follow in his footsteps by gaining admission to the provincial high school. To that end, the two boys traveled to Mazar-i Sharif so that the younger boy could meet with school officials and complete the entrance exam. The documentary followed the boys as they traveled by truck to the city and wandered through the bazaar. It was the younger boy's first trip away from his village, and his more experienced friend immediately took him to the used-clothes market to buy a second-hand suit. If he was going to go to school, he had to look the part. As they left the shop and were walking down the sidewalk, the camera trailed close behind. The two boys looked the same except that the older one had a more confident stride and the younger one was wearing a turban, the loose end of which hung down the back of his newly purchased coat. The camera watched from behind as they strolled along, and then it appeared that the older, bareheaded boy said something to his friend, for the next thing we saw was the younger boy removing the turban from his head, wadding it into a ball, and stuffing it into his pocket. It was a tiny gesture that took only a few seconds on screen, but I have since come to believe that it represented a profound transformation not just for one boy but for a whole society. On one level, the boy's removing his turban reflected the self-conscious rejection of one world based on the sudden recognition of its difference from some imagined, other world. As long as the younger boy had been caught up in the traditional world of the village, the turban reflected his immersion in and commitment to the village and its culture. For a sixteen-year-old, which is about the age of the younger boy, the turban would have symbolized the essence of his identity and his acceptance into the ranks of adult men. If someone back in the village had knocked it off his head in an argument, the boy would probably have taken it as a serious insult that had to be avenged. On the streets of Mazar-i Sharif, however, the turban suddenly represented something else—something in his present condition that he would have jettisoned if he could. In his imagination, or so I presume, the boy stood on the threshold of a new and inviting world that he had come to perceive as embodying his own future existence. But this new world was as yet dimly perceived and could only stir in him—besides a fierce desire to be part of it—an equally intense consciousness of his own inadequacy. In and of itself, the gesture of publicly removing a turban would seem to reflect a consciousness that imagined itself as something other than what it was, only a moment before, and something other than what it had always reckoned itself to be. It was, in some sense, a hopeful gesture of faith in, or submission to, a possible future; but it was also, and more tellingly, a condemnation—or at least a diminution or relativization—of society as it had been known and what it represented. When I first saw Naim and Jabar, I remember being more impressed by the exotic beauty of the Afghan mountain landscape of the boys' village than by the situation of the two boys themselves. At the time, I didn't know the political controversies that seethed below the surface in Kabul, much less the maelstrom toward which Afghanistan was headed. Nor had I read Thomas's account of his trip to Afghanistan, and so I couldn't have recognized the possibility that the scene in Naim and Jabar completed an arc begun in Kabul fifty-some years earlier—from a king remaking his summer palace in the image of a Hollywood film to a poor boy pocketing his turban in order to fit into his own humble version of the modern imaginary. For Amir Amanullah, clothing was a symbolic manifestation of a nation's progress. For the young boy in Naim and Jabar, it would seem to have the related significance of "fitting in" and "looking the part" for which he too was auditioning. Looking back, I imagine that the Afghan students who sat in my classroom in their second-hand Western clothes must have felt a similar concern, but at the time I didn't make the connection between the boys in the film and the students I encountered every day at the school. Only much later, when I rented the film to show a classroom of American college students what Afghanistan was like before the revolution, did I focus on the scene with the turban and come to reflect on the fact that many of those Afghan students I taught a long time ago must have experienced moments like the one in the film when they too had to make a decision between one world and another. Nor did I fully grasp until seeing the film a decade later that it was boys like Naim and Jabar, as well as my own English-language students, who provided the bulk of the membership of both the Marxist and radical Islamic parties that plunged Afghanistan into its quarter century of crisis. During my first stay in Afghanistan, in the 1970s, there were political rumblings to be sure, but I and most of the Westerners of my acquaintance were blissfully unaware of how deep the discontent was. Everywhere one went in Kabul in the mid-seventies, one saw photographs of the bald and seemingly benign countenance of the Afghan ruler, President Muhammad Daud, who appeared very much in charge. Few of the people I spoke with doubted the country's basic stability, and only much later did we discover that beneath the apparent calm, leftist and Islamic political parties were both feverishly making plans to overthrow the government. As a newcomer to Afghanistan, I had no way to know the extent of the discord in the country, although two events might have provided clues if only I had been able to see them clearly. The first occurred shortly after my arrival in Kabul; Islamic militants belonging to the Muslim Youth Organization (Sazman-i Jawanan-i Musulman) staged armed uprisings in a number of provinces. The government had little trouble suppressing these attacks, and press reports indicated only that there had been local disturbances. They did not advertise the organized and political nature of these attacks. I don't recall whether I read any press accounts or spoke with anyone about the incidents; however, I do remember that I had been planning to take a trip to the north of the country but was prevented from doing so when the main road crossing the Hindu Kush was closed. My second hint as to the scope of dissatisfaction in the country came the following October, when I finally made it to the north during an extended school vacation commemorating the end of the month of fasting. I traveled by bus to Mazar-i Sharif, then caught another local public van to the nearby town of Balkh, where I arrived close to dark. I found a hotel and was able to rouse the manager, but he soon made it clear to me that he didn't want me to stay and indicated that I should return to Mazar immediately, that there were thieves around who would steal my possessions and possibly slit my throat. I couldn't tell whether the threats were real. They might have been, but I suspected that he just didn't want to be bothered having to deal with a visitor during the upcoming holiday. I was the only guest at the hotel and, as far as I could tell when walking around, the only foreigner in the city. That night at dinner in a local restaurant a young man a few years older than myself, with a scrawny beard and thinning hair, sat down at my table and started a conversation. I was initially suspicious of the man's friendliness, particularly when he asked me to accompany him back to his residence. The hotel manager's warnings were still with me, but I was lonely and decided to go anyway. He lived by himself in a small rented room, amid a clutter of books and papers. He split open a melon, which we savored between cigarettes and cups of tea. He called himself "Aqcha Poor," the son of Aqcha, which was the town a few hours west of Balkh where he was raised, and I learned that he was working as an agricultural extension agent, although it was clear that what he really enjoyed doing was reading in his room, which he referred to as his "library." I spent most of the next two days with Aqcha Poor, visiting friends of his in villages outside Balkh, eating sumptuous meals of rice pilau, kebabs, and dumplings, and all the while hearing about his life as a young man. sar-i koh-i beland, yak dana gandom. I am a poor stranger in a foreign land. gharibi mekonom ba mulki mardom. Working, working, I have grown tired. gharibi karda karda khwar gashtam. To both friends and enemies, I have. ba pesh-i dost o dushman zar gashtom. The song was one of several that Aqcha Poor taught me, and all conveyed the same despondence. In some respects, they were like the songs of another man from Balkh who sang of dispossession—Jalaluddin Rumi, or, as he is known to Afghans, Jalaluddin Balkhi. Rumi's recurring lament centers on his separation from the Beloved, and Westerners sometimes imagine that he is writing about a human love object. But it is God and the promise of eventual reunification with the Divine that give the poet the strength to continue his labors on earth. Aqcha Poor's lamentations, while they conveyed the same sadness, were more earth-bound, and it did not appear to me at the time that he saw any end to or mystical significance in his present circumstances. Perhaps that too was one of the unintended legacies of schooling. Perhaps education not only promised more than it could deliver but also took away things that could never be recaptured. As I look back on him now, it strikes me that Aqcha Poor had more in common with Naim and Jabar than I recognized at the time. Naim and Jabar, after all, stood on the threshold of a new life they imagined for themselves and for which they were willing to leave behind all that they had previously known. Aqcha Poor was on the other side of the divide. He had been accepted to schools and completed his education and found a job with the government, accomplishing what the younger boys were hoping for themselves. But instead of giving him the sort of responsibility and prestige he had imagined, the job only made him feel poorer than ever and less appreciated. Underpaid, with few resources to draw on and limited professional and personal prospects, Aqcha Poor found himself identifying with itinerant laborers who journeyed to Pakistan and other foreign countries to earn a living wage. This is not what he envisioned would happen when he started school, and he was not alone in his disappointment. Some expressed their sadness and disillusionment the way Aqcha Poor did—through poetry. But others chose different means, the most important of which was joining political parties that promised to transform the system and make those presently powerless the new masters of the nation's destiny. I don't know what happened to Aqcha Poor after our meeting. I don't know whether he became involved on one side or another of the conflict that was about to embroil Afghanistan, and I also don't know whether the song Aqcha Poor sang so passionately for me foretold his own fate of becoming a refugee in a foreign land like millions of Afghans in the coming years. Nor, finally, do I have any idea whether he has so far survived the conflagration and is alive today. I knew Aqcha Poor for only a few days, but, looking back on this man who was for a brief time my friend, I see him as representative of a generation of Afghans who, even before the war had started, despaired for their country and themselves, even as they continued to hope that modernity would lift them up. Once during my short visit, Aqcha Poor asked me what I hoped to do with my life, and I told him that I wanted to be a writer. He replied, "Then you should write a book about me." And I faithlessly promised him that I would. But in a sense I honor that promise here, for if this book is not about Aqcha Poor himself, it is about his kindred, particularly those who decided that they would shape Afghanistan's promise to their own purpose. Aqcha Poor, I suspect, did not become actively involved in political activities. His temperament seemed more that of a poet than a politician, but many others of a more active nature were determined to convert their unhappiness with Afghanistan's situation into political change. These were the ones who were caught up in the ideological currents that came rushing through Afghanistan from abroad in the 1970s. Like Aqcha Poor, they felt the pull of the new, as well as the disillusionment that accompanied the realization that modernity meant mostly more corruption and a soul-dissolving break with the past. This book is about a few of the people who shaped the response to the place that Afghanistan had become—people who tried to implement their own visions of modernity. At the same time, the book is also about the failure of these men and of the visions they had for their country, a failure that would lead to the total eclipse of the modernist dream of change. Western attempts to understand Afghans and Afghanistan since the onset of the war in 1978 have centered largely on stereotypes and personifications. Just as Thomas tried to fit the country into the preconceptions of his day, Western writers—Americans in particular—have resorted to modes of representation that make the complexity of the people and place simpler to comprehend. In the early days of the conflict, Afghans were widely portrayed as "freedom fighters"—twentieth-century throwbacks to Ethan Allen and the Green Mountain Boys, transplanted to the Hindu Kush. This was especially the case after the Soviet invasion in 1979, when Afghans were perceived as standing up single-handedly to a superpower. Vietnam still rankled in the United States, and the Afghans seemed to want nothing from that superpower other than the barest military necessities. Democrats and Republicans alike could support this cause, as theatrically illustrated first by Zbigniew Brezhinski, President Jimmy Carter's national security advisor, firing an AK-47 into Afghanistan from the Khyber Pass and later by President Ronald Reagan parleying in the White House with a group of bearded mujahidin leaders. All of this cozying up to men in turbans ended abruptly after the Soviet withdrawal from Afghanistan in 1989. The first U.S. response to this event was massive indifference—Afghanistan ceased to matter, at least to non-Afghans. It simply fell off the radar screen of international attention. Indifference eventually gave way to another round of intense interest, this time precipitated by the World Trade Center bombing in New York City and the news that several of those arrested for the attack had fought with the resistance forces in Afghanistan. Investigative reports into the bombing hinted at vast conspiracies involving mosques in the outer boroughs of New York City, immigrant taxi drivers, and a blind cleric named Abdur Rahman, who appeared to have incited the bombers to declare jihad against the United States itself. The effect of this second wave of attention was to change people's minds about who it was the United States had been supporting and what those bearded men really wanted. Now, instead of being viewed as "freedom fighters," Afghans came to be thought of as terrorists, and Afghanistan took its place beside Syria, Libya, and Iran as a pariah state beyond the pale of President George H.W. Bush's much heralded "new world order." Afghanistan's association with terrorism was not entirely unwarranted. And it was not simply a Western concern, for many of the Islamic militants who committed acts of terror in Algeria, Egypt, and other Middle Eastern nations received their basic training in Afghanistan and were often referred to in these countries as "Afghanis." Then, too, there was Osama bin Laden, who maintained a base in Afghanistan and who may or may not have financed the embassy bombings in East Africa in 1998 and the attack on the U.S. Navy destroyer Cole in 2000. But one nuance that was generally ignored was that while an Afghan connection was often referred to in press accounts, few Afghans were implicated in these acts of violence. Those responsible, for the most part, were Arabs, and while many of these Arabs fought in Afghanistan, they were by and large uninvited guests. Afghans didn't ask these people to join their battle. They came for their own reasons, mostly kept to themselves while they were there, and went about their own projects after they left. Afghanistan's role was principally to provide a space beyond governmental control where ideologues could transform themselves into battle-hardened Muslim warriors. Unbidden or not, Afghanistan's helpmates fixed the public's perception of Afghans, a perception that was amplified by news reports about the Taliban government, which installed itself in power in 1996. Many accounts in the media described how the regime forced women to leave schools and jobs to return to the veil and domestic seclusion, and frequent stories related how the government invited the citizenry, for their moral edification, to witness the surgical removal of the hands of thieves, the stoning of adulterers, and the toppling of brick walls onto the backs of sodomites. While international terrorism and the Taliban excesses were the focus of news and commentary on Afghanistan, more scarce were attempts to understand what life was like in Afghanistan in this protracted period of conflict and how the situation evolved. In their focus on the sensational and grotesque, the media led the public to assume, in essence, that "since all we ever hear about is violence, this must just be the way Afghans really are, the way they have always been, and the way they will continue to be." The goal of this book is to provide a nuanced understanding of the war in Afghanistan by presenting the life stories of three Afghan leaders who played important roles at key junctures in the Afghan conflict. Because the impression of Afghanistan in the West has centered around a series of sensationalized stereotypes, my objective is to provide an alternative set of biographical representations that provide a sense of how leaders viewed themselves and the conflict they were involved in at different stages and how they attempted to mediate the longstanding problem of realizing present opportunities without abandoning the past. The biographical framework employed here follows a model developed in my earlier book, Heroes of the Age: Moral Fault Lines on the Afghan Frontier, which was also focused on three approximately contemporary men from the turn of the century—Sultan Muhammad Khan, a tribal chief; the Mulla of Hadda, an Islamic mystic, scholar, and political leader; and Amir Abdur Rahman Khan, the grandfather of Amanullah and the ruler of the Kingdom of Afghanistan from 1880 to 1901. I used these three figures to personify the traditional moral imperatives of honor, Islam, and state governance, and I argued that the development of a coherent and stable political culture was impeded throughout the century just past by the coexistence of these three competitive and contentious spheres of belief and practice. Here again, I look at the lives of three men—this time individuals who played important roles in the present conflict and who personify contemporary transformations in Afghan understandings of honor, Islam, and state rule as they developed in and through the critical first years after the revolution of 1978. Contemporary understandings of honor, Islam, and rule bear similarities to the forms that prevailed at the turn of the previous century, but they have also changed in many ways, largely as a result of the ideological currents that have swept into Afghanistan from abroad periodically since the beginning of the twentieth century. One of the leaders whose life is examined in this book—Nur Muhammad Taraki, the founder of the Marxist People's Democratic Party of Afghanistan—played a pivotal role in initiating the revolutionary political culture. The other two—Samiullah Safi, who was a leader of one of the first tribal uprisings against the Marxist regime, and Qazi Muhammad Amin, the deputy amir of the Hizb-i Islami party, which, along with several other Islamic political parties, took control of the antigovernment uprisings and effectively "Islamicized" the resistance—both came of age during the tumultuous period of the late 1960s and early 1970s. As befits the present age, the figures at the center of this book cannot be called heroes—at least not in the sense that I used the term to describe the men whose lives I examined in my earlier book. These men all played pivotal roles at crucial stages of the current conflict, but they are not larger-than-life figures the way Sultan Muhammad Khan, Amir Abdur Rahman, and the Mulla of Hadda were. They are instead men in-between who, as much as they helped shape the events of their time, also got caught up in and eventually pulled down in the backwash of those events. The men whose lives are described and interpreted in this book failed in their purposes. The revolution, uprising, and jihad that they separately supported all ultimately collapsed. But it is because of this failure that I find their stories useful to tell, for ultimately the story of the war in Afghanistan is not the story of success, despite the momentous achievement of defeating and helping to topple a global superpower. It is rather the story of a series of ill-conceived, though fateful, attempts to define what Afghanistan stood for and to make Afghanistan cohere as a nation in ways different from the ways it had cohered in the past. One reason I am particularly interested in the stories of Safi and Qazi Amin is that they both have a connection to the "heroes" of my previous book: Safi is the youngest son of the tribal chief Sultan Muhammad Khan, and Qazi Amin's father was a cleric and disciple of one of the Mulla of Hadda's principal deputies. These connections are significant because they help contextualize changes that occurred in tribal culture and in the social universe of Islam both prior to and since the Marxist revolution. As university students during the period of political turmoil in the 1960s and 1970s, Safi and Qazi Amin became involved in radical reform movements, but both also kept a foot in the world of their fathers, which for Safi was his tribal homeland in the Pech Valley and for Qazi Amin was the universe of religious schools. For these two men, the political controversies they became enmeshed in had to do partly with how to bring about the proper sort of reform and partly with how to salvage aspects of tradition. Safi and Qazi Amin would have disagreed on what beliefs and practices were worth saving, but they shared the quality of respecting features of their patrimony that many of their more radical peers would have happily destroyed. For his part, Taraki does not have any direct connection to Abdur Rahman Khan, other than the distinction of being responsible for eradicating the last links to the old amir's lineage. However, his position as head of state forced another connection on him—that of having, in the words of Lord Curzon, "to ride the wild Afghan steed. "5 Which is to say, Taraki had not only to dominate; he had also to persuade, framing his leadership in ways that would be meaningful to the people he ruled, just as Abdur Rahman and all successful rulers have had to do. The future of the Marxist revolution thus hinged largely on the ability of Taraki and his comrades to convince the Afghan people that his socialism meshed with their cultural and religious values. As with Safi and Qazi Amin, the key to success lay in balancing reform with tradition, and his ambitions, like theirs, ultimately foundered on his inability to effect this balance. Just as one of the lenses I employ for looking at the Afghan conflict is the agency of these particular men and how it differed from that of those who preceded them, I am also concerned with the events—more particularly the underlying structure of events—that they participated in and that they were finally unable to control. In the case of Taraki, those events principally were the conflicts within his own ruling party that led to his removal from power (discussed in Chapter Three). For Safi, they were internal failings within the tribal group and external subversion by Islamic leaders within his home area, which undermined his leadership and the viability of his tribe as a political force in the resistance (discussed in Chapter Five). With Qazi Amin, the events were driven by the incompatibility between the radical Islamic vision of his group and the views of the other party leaders, which eventually opened the way for an alternative, and far more conservative, Islamic movement to come into being (discussed in Chapter Seven). This movement culminated in the transformation of the Taliban student militia, which took control of most of Afghanistan, including the capital of Kabul, in 1996, into the Islamic Emirate of Afghanistan. Retrospectively, it is evident that ruptures in the resistance (between tribes and parties and among the parties) that developed in the immediate aftermath of the Marxist revolution and Soviet invasion created the conditions for the later triumph of the Taliban. These ruptures are the focus of this book and of the lives that are documented here. 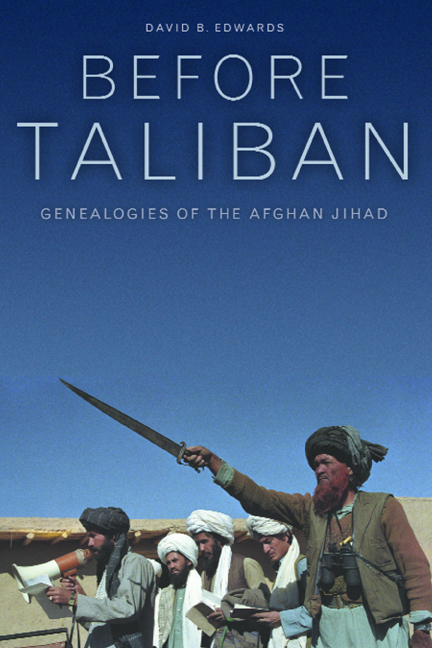 In many ways, the cruelest irony of the conflict is that the struggles of the early years should have resulted in the ascendance of the conservative Taliban government, for the three men whose lives I examine in this book were all committed in different ways to the ideal of progress—the opposite of what the Taliban have come to represent. All three were products of the Afghan educational system and were offended by what they saw as the backwardness of traditional society and committed to the ideal of bringing economic and social justice to the people of Afghanistan. At the same time, however, these men were cut off from those they sought to lead and had a limited or distorted conception of what the people wanted and how best to enlist their support. This was especially true of two of these men—Taraki and Qazi Amin—who were leaders of political organizations that insisted that people's first loyalties should be to the party itself, which held the authentic hope for the future. Acquiring power for the party became for both sides more important than the ideals the parties stood for, and this focus, over time, became an obsession that ultimately cost them the trust of the people. This sadly has been the legacy of social reform in Afghanistan—a legacy that began with the social experiments of Amanullah in the 1920s and that finally resulted seventy years later in the advent of the Taliban regime, whose overriding ambition is to return the country to an imagined state of original grace before the coming of secular education and other imported evils from beyond Islam's borders. 1. Thomas 1928. Unless indicated otherwise, all quotes in this section are taken from this work. 2. When Thomas first got to India, he seemed to have had it in mind to focus his story on a colonial officer, Major Francis Yeats-Brown of the Seventeenth Bengal Lancers, whom he had met during his travels. Yeats-Brown, or "Y.B." as Thomas called him, was the closest approximation to Lawrence that Thomas could come up with. Fluent in a number of local languages and reportedly prone to dressing up in native dress and disappearing for days at a time in the native suq, Yeats-Brown was also an aviator and war hero, having been shot down behind Turkish lines during the war. Like Lawrence, he had even performed undercover intelligence work, in his case, in the guise of a middle-class German woman living in Istanbul! Yeats-Brown was, in other words, Lawrence flambé, with a heavy sauce of Rudyard Kipling on top. Fortunately or unfortunately for Thomas&'s travelogue, Y.B. was unable to play a role in the Afghan adventure because of the refusal of the Afghan government to issue an entry visa to a British officer. 4. See Mack 1976 and Caton 1999. In the mid twentieth century, Afghans believed their nation could be a model of economic and social development that would inspire the world. Instead, political conflict, foreign invasion, and civil war have left the country impoverished and politically dysfunctional. Each of the men Edwards profiles were engaged in the political struggles of the country's recent history. They hoped to see Afghanistan become a more just and democratic nation. But their visions for their country were radically different, and in the end, all three failed and were killed or exiled. Now, Afghanistan is associated with international terrorism, drug trafficking, and repression. Before Taliban tells these men's stories and provides a thorough analysis of why their dreams for a progressive nation lie in ruins while the Taliban has succeeded. In Edwards's able hands, this culturally informed biography provides a mesmerizing and revealing look into the social and cultural contexts of political change. David B. Edwards is Professor of Anthropology at Williams College. He is the author of Heroes of the Age: Moral Fault Lines on the Afghan Frontier (California, 1996).